A simple 3D printable ball and socket mount that you can use to mount a Raspberry Pi camera module or one of my Raspberry Pi cases onto any suitable surface, like a wall or another case. It provides three degrees of freedom and a screw to lock the alignment. 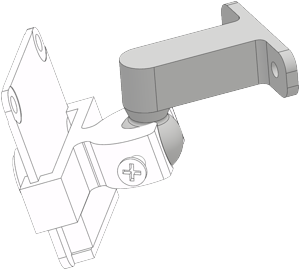 A similar alternative would be the Hinge mount. For this mount you need to print two parts, one ball and one socket part. 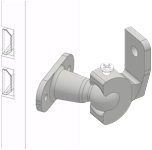 Then just snap them together and lock the desired position by tightening the lock screw. This are some examples how you may use the ball and socket mount independently or in combination with my other projects. A ø2mm screw for the alignment lock (if wanted). There are little cutouts on the inside around the screw hole that are needed because the official v1 and third party cameras have a little SMD capacitor extremely close to it. Just in case you wonder. You can use this mount in multiple ways. The example assembly image shows the simplest. Only two screws (or bolt and nuts) are needed. Another way would be to combine it with the front cover from Case for the Raspberry Pi camera. Other ways of use I can think of are combinations with M12 mount on Raspberry Pi camera module or IR cut filter with M12 mount on Raspberry Pi camera module. Screw mount with socket connector. Put the camera module into the left and right nut and slide it to your desired position. A little force should be necessary, but not too much. Friction will then keep it in position. If it takes too much force to insert it, you may have to clean the part or tweak your printing settings and try again. Or try the Screw mount above. 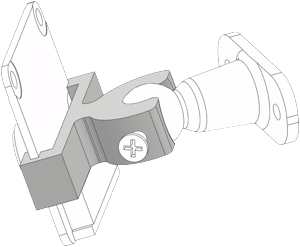 Slide mount with socket connector. 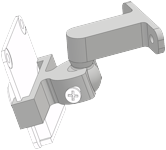 With this part you can install your mount assembly onto many of my cases and other surfaces like walls or balks. It provides three mounting holes. The middle one on the backside can be used to install the mount on one of my cases or other thin objects. The two others can be used on any suitable surface. Ball surface mount with 90° angle. 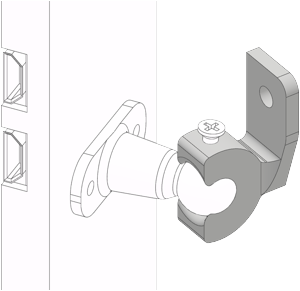 You can use this part to install your mount assembly onto a wall or balk or any other suitable surface. The screw goes in from the front. My setups are usually small and light, so I only need small screws/nails. Those prepared variants with ø2mm and ø3mm holes can be downloaded below. But I can prepare bigger variants if needed.